I don’t know for sure but I guess it’s because ar is more lightweight than tar. We don’t really need permissions/owners/etc. on the debian-binary, control.tar.gz and data.tar.gz files. From what I gathered the difference is that the “tar” format is binary and uses block sizes of >1024 bytes, while “ar” has a less portable plain text format header of just 59 bytes. This way the outer shell of a .deb archive is smaller and doesn’t need to be compressed. There is one thing to “manipulating” the .deb file with ar, though: Please be aware that the GNU version of ar does produce a .deb package that isn’t compatible with the archive tools. The GNU ar tools adds a / after the filename inside the archive, which dpkg-build doesn’t. So even if dpkg-deb does not add trailing / to generated .debs it has supported ar archives with them since 1999 (commit id 16c0f50ed6826cd064510101c60ba98a582759dd). I’m not sure what you refer to with “archive tools”, but anything not supporting trailing slashes while not using dpkg-deb is buggy IMO. The current .deb format supported by dpkg is documented in detail in deb(5). The only problematic case is dpkg-split which didn’t support trailing / until recently, fixed since 1.15.6 (commit id e5c584abd37b59ba4d7cda44f7bad7c98dbd075b). So although not encouraged, being able to handle (including creating) .deb archives with generic Unix tools is something that should be supported, and it was one of the reasons for the format being designed that way back then. I have a question, dpkg-shlibdeps uses shlibs and symbols files for a single package or uses shlibs files or symbols files for a single package? Tony, I’m not sure that I understand your question. dpkg-shlibdeps prefers symbols files over shlibs files when there’s one. But then it can use both while generating the dependencies for a given binary since it might use multiple libraries: for example one with only shlibs, and one with symbols+shlibs. I wish the debian build system was as useful as Arch Linux’s PGKBUILD. For example, If I want a later version of a package in Arch I just change the version number in the PGKBUILD file, get the new md5 info and build package. There is no way that will work in the debian build system – you cannot get a later version by just spending a minute or 2 …..
$ cd foo-2.0 && dch -v 2.0-1 "New upstream release"
Debian packages a pre-compiled binary packages, ARCH packages are built from source on your system, like macports or gentoo. This is an essential distinction and I don’t think you can really compare them the way you do. Each of them has its advantages and issues. For instance, with ARCH linux, how do you deal with new libraries’ ABI/API? Say you bump the version and m5sums in PKGBAR and rebuild but it turns out that the binary has different symbols..
– I would not have a clue how do to the same in Debian – in Arch its just so easy. 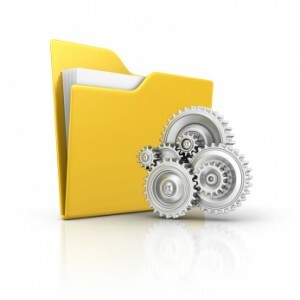 Do want that folder-with-gears icon, best in svg format! Thank you so much in advance. Trapdoor, it’s not a free picture unfortunately, I bought it on istockphoto.com. The gears seem to be deadlocked (larger nearer gear covers it a little, but looks like those three in the next plane touch). I would try to fix that if I had it in vectors 🙂 Assuming that each gear is a separate object and that the invisible parts (covered by other objects) are not actually missing. Hi! thanks for your article! I’ve been using .deb packages for a long time but never knew about this kind of details. Do you know if there’re plans in order to improve the package managers like aptitude? what improvements from a user perspective can we expect? Thanks. Please continue with this kind of article. It’s pretty easy to understand! I have a question. I notice that multiple runs of dpkg-buildpackage generate different .deb packages (different MD5 digests). Do you know why? Tar archives embed timestamps of the files. And many files are generated during the build (all those than end up in the control.tar.gz for example) so the at least the timestamps differ. And even the gzip compression layer embeds a timestamp by default (see the -n option in the manual page).